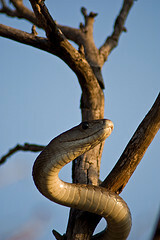 After the king cobra, the black mamba is the longest venomous snake in the world. It is also the fastest-moving snake in the world, reaching up to 23km/h. Status: At present not endangered. Increasing human disturbance could cause a threat in the future. According to the IUCN the black mamba is classified as Least Concern. After the king cobra, the black mamba is the longest venomous snake in the world. It is also the fastest-moving snake in the world, reaching up to 23km/h. The snake although called Black Mamba is not black at all! It is named black due to the black colour inside it's mouth, the snake itself can be grey or a green/yellow colour.